My Nonna’s Chicken Meatball Soup is a very special recipe from my favorite lady. Enjoy this on Easter, holidays or for a special Sunday dinner! Without question, this is the most special recipe on my blog. This was Nonna’s signature dish, the one I most wanted to learn to make. It was the highlight of our Easter dinners, and sometimes more often, if we were lucky. I’ve been waiting for soup weather to arrive so I could share it with you. I hope I can do justice to Nonna’s Chicken Meatball Soup — and her — as I write. 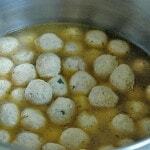 First, I need to mention that my family has always referred to this as “soup with the chicken balls.” I never thought it sounded strange. But, seeing it in writing made me realize the name’s an oxymoron. Besides, I can’t go around the Internet talking about chicken balls. So, “Nonna’s Chicken Meatball Soup” it is. In case you’re thinking of typical, slightly firm meatballs, I must point out that these are different. They’re more like soft pillows of chicken and Italian cheeses, providing a burst of incredible flavor with each bite. I have so many memories of Nonna making this soup with Mom when I was growing up. They always made a huge batch, starting with an enormous pot filled with a whole chicken, water, carrots, celery, onion, tomatoes, herbs, peppercorns, and salt. As the soup simmered on the stove for hours, the comforting aroma would fill our house, creating anticipation for what we knew would be one of the best meals of the year. When the chicken was cooked, Nonna would place it on a platter to remove the skin and bones. She’d then put the meat in a large bowl and begin shredding it with a fork and knife. Next, she’d add the Romano cheese, eggs, homemade bread crumbs mixed with Parmesan and garlic, parsley, and seasonings. She’d mix everything together with her hands and taste it to see if it needed more cheese, etc. Then, it was time to roll. Nonna and Mom would shape meatball after meatball and line them up on baking sheets. Just before dinner, they’d put some soup on to boil with water in a smaller pot, and gently place the meatballs inside to cook in batches — separately from the pasta that would be cooked in an adjacent pot of soup. 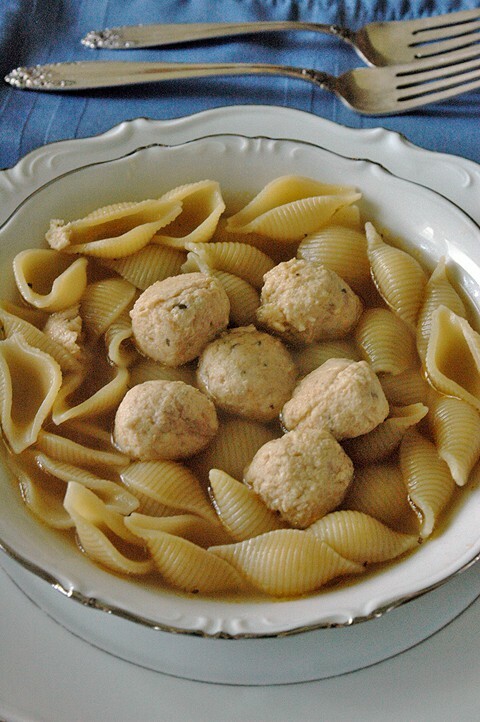 The soup and meatballs would be served in large bowls with small or medium pasta shells. We’d add spoonfuls of freshly grated Parmesan cheese at the table and wait to say grace before eating. On Easter, Nonna would dip the palms from Palm Sunday in holy water and bless each of us with a couple of drops, her eyes filled with tears as she surveyed her grandchildren, daughters, and sons-in-law. This was her joy, to see her family together, enjoying the meal she’d so lovingly prepared. After Nonna passed away, Mom continued to make this soup on Easter. This year, I finally learned to make Nonna’s Chicken Meatball Soup too. This time, it was Mom and I standing at the counter, rolling the meatballs, with the soup waiting on the stove. We talked about Nonna as we worked, and I could feel her presence, as I do now. I know that Nonna would like her grandchildren, great grandchildren, and great-great grandchildren to have this recipe. Above all, I think she wants us to remember that the most important ingredient is love. P.S. Serve this soup with Escarole with Raisins and Pine Nuts, The Best Italian Green Salad with Homemade Dressing and perhaps some Almond Pizzelle Cookies for dessert! My Nonna's signature dish is one of the best meals you will ever have. The delicate meatballs are like soft pillows of chicken and Italian cheeses that provide a burst of flavor with each bite. Set aside a day to make this special meal with love. Remove giblets from inside the chicken cavity and discard. Place the chicken in a 12-quart stock pot on the stove and fill the pot with enough water to cover the chicken. Cook on high heat, uncovered. As scum rises to the top, use a spoon to remove and discard it. Remove the skin and bones from the chicken and discard them. 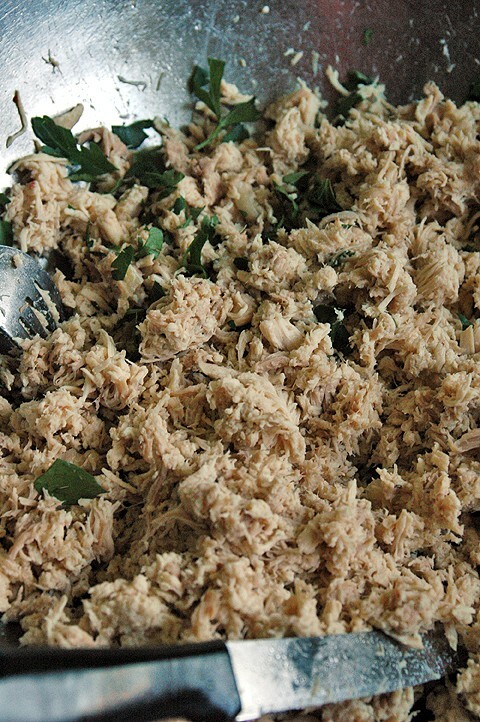 Place the meat in a large bowl and shred it with a fork and knife. Add in remaining meatball ingredients and mix well with your hands or a fork. Taste a pinch to see if it needs more salt, pepper, or Parmesan. 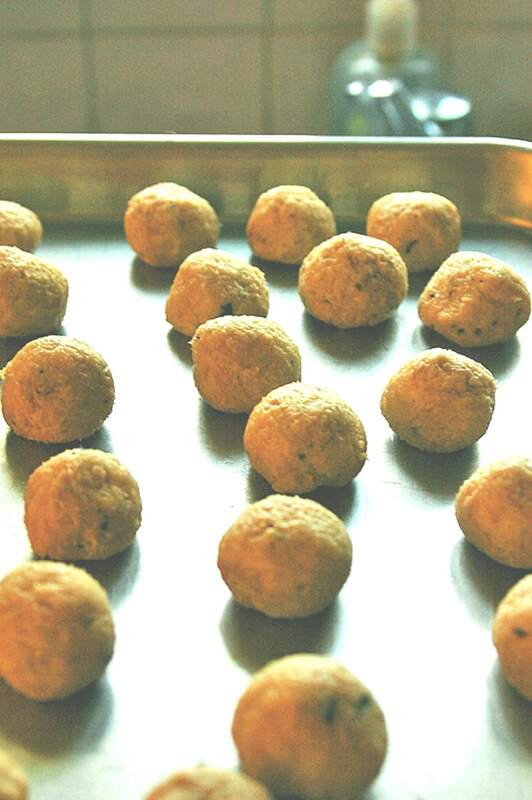 Roll the meat mixture into 1-inch balls and place them in a single layer on sheet pans. The meatballs can stay at room temperature for up to two hours before they need to be cooked in the soup or refrigerated. Set up your stovetop with a large pot filled with the hot soup (no heat under it), a pot with enough soup to cook your pasta (no heat until later), a shallow pan with sides to cook the meatballs, and a pot filled halfway with soup (no heat under it) to hold the meatballs after they are cooked. In your wide, shallow pan with sides, boil two cups of soup broth and 2 cups of water. Add as many meatballs as will fit in a single layer. The meatballs will rise to the top when they are cooked, which will take 5-6 minutes. 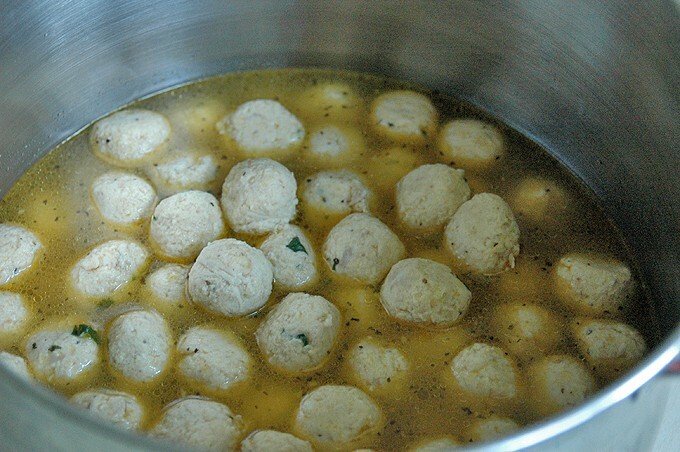 Remove the cooked meatballs with a slotted spoon and transfer them to your pot filled halfway with broth. Continue cooking the meatballs in batches, adding more water and soup to the pan as needed. It is fine to stack the cooked meatballs in the holding pot as you go. When you are done cooking all of the meatballs, the pots can sit on the stove without heat for up to 1 1/2 hours. When you are ready to cook your pasta, heat the pasta pot on high. Place low heat under the pots containing the meatballs and the soup. Add the pasta to the boiling soup and cook until al dente. Do not drain. To serve: Fill each large soup dish with some pasta, six meatballs, and broth ladled on top. Provide extra Parmesan at the table. Soup, pasta, and meatballs can be stored separately in the refrigerator for up to three days. 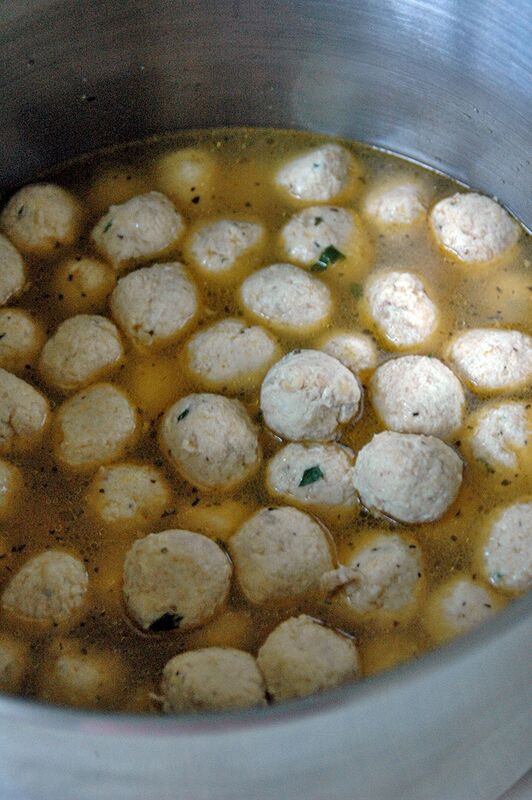 Soup and meatballs can be frozen separately for up to three months. For this soup, the chicken needs to cook longer than usual, so that it will be soft enough for the meatballs. Five pounds of chicken will yield about 100-110 meatballs. They freeze beautifully after they are cooked. To freeze them, portion them out in a single layer in freezer bags and lay them flat in the freezer for up to three months. Add them to a pot of boiling soup (or simply use two parts chicken stock to one part water) and boil them just until heated through. Gently remove them with a slotted spoon. If you wish, you can use half of the shredded chicken for meatballs (reduce the meatball ingredients by half) and freeze the remaining shredded chicken (portioned in freezer bags) to use in other dinners, such as enchiladas. What a wonderful post! How blessed your family has been and will be with memories of this wonderful woman and her recipes. I hope to make this recipe soon. Thanks so much for sharing! I will try this chicken meatball soup during the month of October. I cannot wait! I’ve already prepared the caponeta, zucchini e pasta, and the sausage and peppers on several occasions this summer. Although I’m certain you’ve heard this many times before, you’ve made your grandmother and mother very proud. Cindy, your comment means so much to me. I am touched when anyone makes a recipe from the blog and lets me know. I feel connected to everyone in a special way. Thank you, and I hope you enjoy the soup! Chicken ball soup! Ha! Love it. This sounds and looks amazing. Thanks, Denise. She was my favorite lady. Tekesha, I love your comment, and I hope you enjoy the soup! Not only do the meatballs taste better cooked in the broth, but the broth tastes better for having the meatballs cooked in them. Win-win!